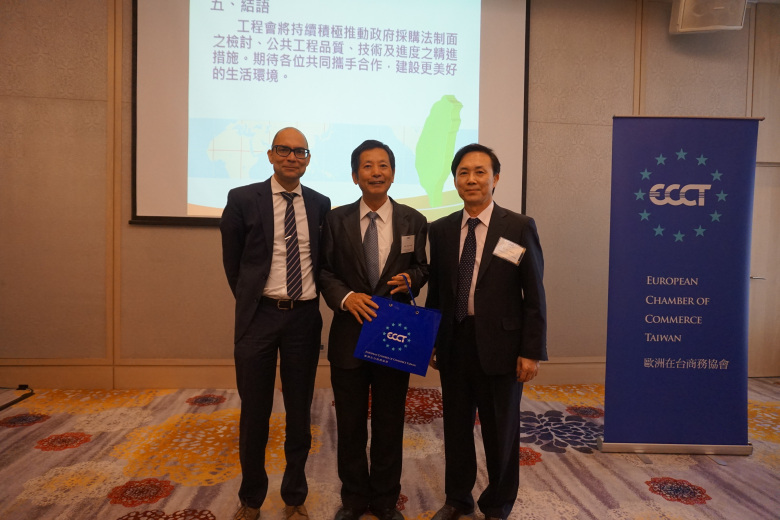 The ECCT's Project & Procurement and Wind Energy committees jointly hosted a lunch on the topic "A new alternative and flexible approach to public procurement projects in Taiwan with guest speaker Yan Jeou-rong, Deputy Minister of the Public Construction Commission (行政院公共工程委員會副主任委員顏久榮). According to the speaker, the number and value of foreign participation in Taiwan’s public procurement projects has risen steadily over the past three years. European participation accounted for just under 30% of projects in 2017 for a total value of just under NT$80 billion. Over the past three years the largest contracts have been for power stations, metro rail, port and medicine projects. The first reading of amendments to the Government Procurement Act was passed in Legislative Yuan in May 2018. Major revisions include an amendment to Article 52, which removes restrictions to adopt the most advantageous tender (as opposed mandating only the lowest bid) and amendments to Articles 101 and 103, making the suspension mechanism more comprehensive and restrictive in cases of breaches of contract or irregular conduct. Under the terms of the so-called “Alternative Approaches Acceptable throughout the Life Cycle of the Public Projects” contractors will be given the flexibility to carry out construction projects using alternative solutions not specified in the contracts as long as the alternative methods are beneficial to all parties. This new flexibility has been welcomed by international firms as it would allow them to use modern methods and better materials that would be more environmentally-friendly and save time during all stages of public procurement projects. The PCC will cooperate with other ministries such as the Ministry of Economic Affairs (MOEA) and the Environmental Protection Administration (EPA) to promote the use of environmentally-friendly construction materials and circular methods. There is also a new points scoring mechanism for the performance of public construction companies which includes five scoring indicators covering: meeting production deadlines, penalties for breaches of contract, quality, safety and public response. According to the speaker, by the second quarter of 2018, more than 80,000 standard cases have been accumulated, providing scoring results of more than 10,000 manufacturers. In a question during the Q&A session regarding reorganization of the PCC, the speaker reported that the Executive Yuan has decided to merge the PCC with the NDC in the near future. While the organisational structure of the PCC will change and fall under the authority of the NDC, the PCC will continue to be responsible for the GPA, the Technician Act and the Act Governing the Administration of Professional Engineering Consulting Firms.